Anson-Stoner’s newest branding campaign is right on target. In our experience, good things happen when both agency and client aim high from the start. 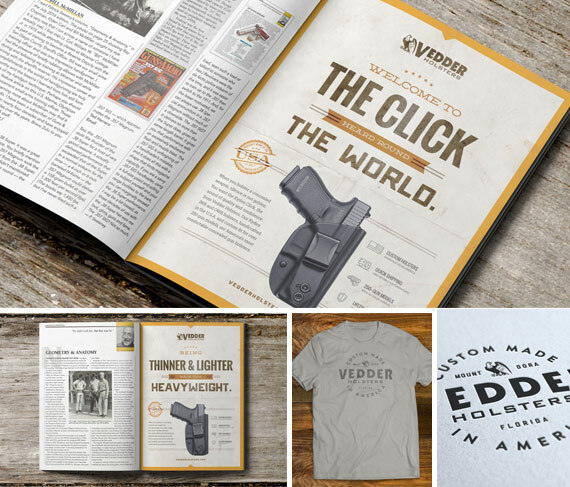 Our relationship with Vedder Holsters is a perfect example, and the result is a newly unveiled branding campaign — including full page and fractional ads and a new website — that packs plenty of impact. Based in Mount Dora, Florida, Vedder Holsters handcrafts a line of comfortable, concealable firearm holsters in-house from top quality materials. The family-owned company currently manufactures eight different designs in 37 colors and patterns for more than 200 gun models. One thing our Vedder Holsters clients can’t conceal is their enthusiasm for quality work. See for yourself by checking out our new ads and visiting Vedderholsters.com.